The speaker at the young-Earth creationist seminar I’m attending also referred to the Robledos Mountains human footprint, allegedly found in Permian rocks of New Mexico. Again, I’m highly skeptical. If this were genuine, it would be the most precious fossil in the entire world. It would be in a glass case in a museum, sort of like moon rocks. Where is this “fossil” now? Why is it not available for scientific examination, even by creationist organizations? I know ICR has scientists who would be competent to examine this object. It would not be difficult to demonstrate whether or not it were a genuine human footprint. 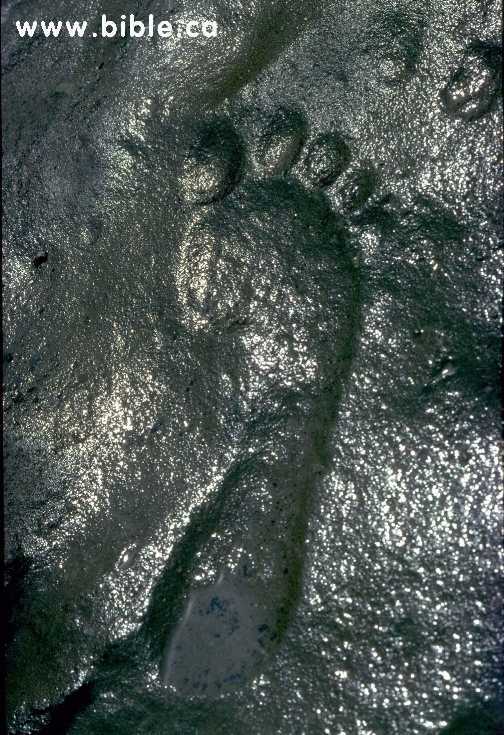 Footprints depress the laminations in the mud beneath the feet, whereas carved footprints cut through the laminations. It would also be fairly easy to determine if the rock itself matched the mineralogy of the Permian rocks in the NM mountain range, or if it were from somewhere else. It looks fake to me. Try walking barefoot in the sand or mud some time. Your footprint will not look like this; it will have more of an impression near the toes and your arch will be almost absent. Perhaps if you very carefully place your foot straight down in the mud, it might look sort of like this. Maybe. But who, in the middle of a world wide Flood, is going to stop and carefully push their foot down into the mud? More fringe than Kent Hovind (“Dr. Dino”) would be hard to do, but perhaps I just don’t have a good enough imagination. It was one of the speakers from Alpha Omega Institute in Colorado. I can’t remember whether it was Dave Nutting or Lanny Johnson (whichever of the two has undergraduate training in geology). After his talk, I asked him why he used the human-tracks-with-dinosaurs argument, being that both ICR and AiG have warned against using it. He pointed to either Patton or Baugh as his authoritative source. I gave him a number of reasons why this sort of argument is anti-apologetics (I didn’t use that word), but of course I didn’t get anywhere. I agree that it is hard to say whether Patton and Baugh are more fringe than Hovind. I would put all three (plus some others, such as Walt Brown) as out of the mainstream of YEC-ism, and I encourage my YEC friends to avoid these guys (of course, I would like to have them avoid AiG and ICR as well). Thanks for the clarifications. If not Baugh or Patton (or handful of similarly dubious cohorts like Juby or Judkins), I’d like to know where the AOI speaker got his info, since outside that small circle, I don’t know any YEC author who has spent much time in the Paluxy and kept up with the literature, who still thinks there are human tracks at Glen Rose. I cringe visiting the AOI site or ones like it, especially when they go on about the supposed arrogance and blindness of “evolutionists”, while making only superficial or illogical responses to arguments against YECism. A typically example is Dan Korow’s criticizing of Dawkins’ observation that the cheetah is obviously a predator, with it’s entire body well suited for that purpose. Korow dismissed Dawkin’s argument as “philosophical” and speculated that cheetahs may have lost their ability to process cellulose, and originally used their teeth and claws to peel fruit–never addressing the most problematic aspect – why their bodies would be built to run over 60 miles per hour if they were designed to eat fruit. I wonder if Korow imagines them running down fleeing oranges and kumquats. I also don’t understand how so many YECs can argue that there was no physical death (thus no predation) before the Fall, when it is biologically and ecologically impossible and not even Biblically justified. By the way, I was disappointed that in the debate with Ham when this issue came up, Nye only cited lions as evidence of a clear predator, allowing Ham to make the usual argument about sharp teeth and claws being suitable for eating plants. Nye could instead (or additionally) have pointed to any number of obligatory predators with structures and behaviors clearly suited only for predation (like spider webs and fangs), as well as thousands of species with elaborate defense structures or camouflage, which make no sense without predators. By the way, I did not post this reply to your blog, but if you think it’s suited for that, you’re welcome to. Best regards, and have a great 4th! Just to add to the discussion. Not fake. I have been to the site. It is remote and unless you really know where it is, you would never find it. It is still in place because the property owners will not allow it to be removed or studied. Casting of the footprint have been made. I know of 2. One is in my possession, the other one is at Carl Baugh’s creationist museum. Using bad evidence for the truth of the Bible usually backfires, and right now, the Paluxy footprints are bad evidence. Rita, Simply declaring a print “not fake” is not a substitute for careful study by a competent geologist. Neither Carl Baugh nor Don Patton (the two YECs who have promoted it most) are that. In fact, both have long histories of false and dubious claims, as even major creationist groups acknowledge, so one has to be very cautious. Have you read my article on the print at: http://paleo.cc/paluxy/zapata.htm ? Even if it the “Zapatta track” were real and not carved, we would need rigorous evidence as to the age of the rock, which so far has not been provided. At any rate, I would be interested in obtaining a copy of the cast in you possession, if you are open to working that out, since it is the next best thing to seeing the original. Do you know why the property owner will not allow it to be studied? May I ask how you got to see it? Did you take any photos of the print, and it’s context (what is around it, so we can see if there is any evidence of a striding sequence?). Did you or others document any other fossils in the same rock bed? You can reach me at gkpaleo@yahoo.com Thanks! several years ago John Morris of ICR tried to throw more confusion on the matter by suggesting some might be human after all, and that they need “more study.” This seems ironic, since ICR moved to Dallas (only about two hours from the Paluxy sites) several years ago, yet neither JM nor anyone else from ICR (as far as I know) have made any effort to further study the tracks. Moreover, JM he confessed to me on site in 1985 that he does not believe that any of the alleged human tracks at Paluxy (either in situ or on loose blocks of rock) are genuine human tracks. At any rate, to be fair to Rita, the so-called Zapatta print is in New Mexico, so ICR and AIG’s comments about the Paluxy tracks would not necessarily apply to it. On the other hand, as far as I know neither ICR, AIG, or any other major creationist group has said anything about the Zapatta track, which seems telling, since you’d think they would if they thought there was even a chance that it was real.